பணியிட எண்ணிக்கை :1பணியிட விவரம் :Junior Research Fellow - 01கல்வித் தகுதி :M.V.Sc. in Veterinary Microbiology/Animal Biotechnology; M.Sc. in Microbiology/Biotechnology/Bio-chemistry with NET qualification; M.Tech in Biotechnology/Genetic Engineering and related disciplinesசம்பளம் :Rs.25000 per month plus 30 Percent HRAதேர்வு செய்யும்முறை :Interviewவிண்ணப்பிக்கும் முறை :WALK-INவிண்ணப்பிக்கும் வழிமுறைகள் :Candidates with full bio data are requested to walk into, Vaccine Research Centre – Bacterial Vaccine, 2 nd floor, Central University Laboratory (CUL) Building, TANUVAS, Madhavaram Milk Colony, Chennai - 600 051 for the Written test followed by interview on 06.02.2019 at 10.00 AM with original certificates in support of age, educational qualifications, publications, awards & medals paper presentation and experience certificate (if any). Working personnel are requested to attend the interview with No objection letter from the present employer. No TA and DA will be provided for attending the interview. 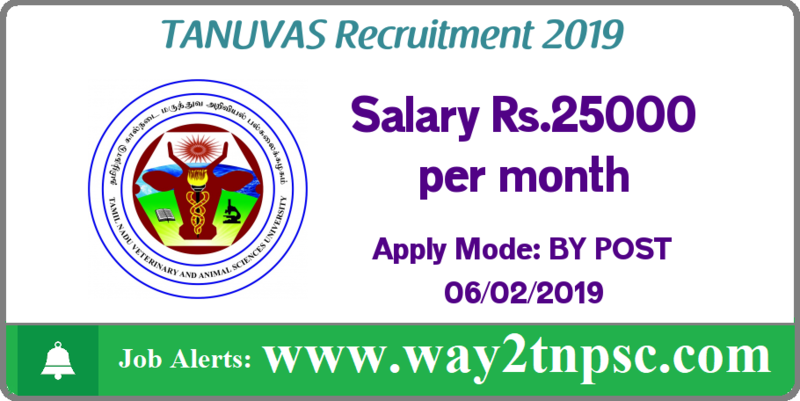 Tamil Nadu Veterinary and Animal Sciences University Recruitment 2019 has been announced for the below vacancies. Read the following Job Notification details to get a clear idea about Registration process, Eligibility, Qualification, How to apply, No of Vacancies, Salary, Job Location, Links to apply, Selection procedure, age limit and all the instructions before applying for this job. Tamil Nadu Veterinary and Animal Sciences University (TANUVAS) is a veterinary university founded in 1989 in Madhavaram Milk Colony, Chennai, India. It is composed of the Madras Veterinary College, Veterinary College and Research Institute, Namakkal, Veterinary College and Research Institute, Tirunelveli ; Veterinary College and Research Institute, Orathanadu and the Institute of Food and Dairy Technology, Koduvalli, Chennai-52. Research farms are for leprosy bacteria, for prawn and edible fish culture, and for animal feed safety. Salary :Rs.25000 per month plus 30 Percent HRAEducation Qualification :M.V.Sc. in Veterinary Microbiology/Animal Biotechnology; M.Sc. in Microbiology/Biotechnology/Bio-chemistry with NET qualification; M.Tech in Biotechnology/Genetic Engineering and related disciplinesApply Mode :WALK-INHow to Apply :Candidates with full bio data are requested to walk into, Vaccine Research Centre – Bacterial Vaccine, 2 nd floor, Central University Laboratory (CUL) Building, TANUVAS, Madhavaram Milk Colony, Chennai - 600 051 for the Written test followed by interview on 06.02.2019 at 10.00 AM with original certificates in support of age, educational qualifications, publications, awards & medals paper presentation and experience certificate (if any). Working personnel are requested to attend the interview with No objection letter from the present employer. No TA and DA will be provided for attending the interview. The above Notification ( TANUVAS Recruitment 2019 for Junior Research Fellow Posts | Apply online ) briefly describes about the details of latest announcement or notification includes important dates like release date , last date of application submission, details regarding fees, exam timings. Candidates, check all the needs and apply accordingly.